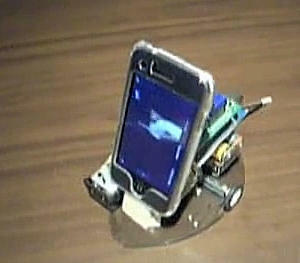 This iPhone robot (moves forwards, backwards, turns) from Japan was made using an Arduino CPU board with a TA7291P motor. It runs on four AA batteries. Post a video! That would be sweeet. Strange that we never see a 360 video of the room. Might so we won’t see the guy with the RC transmitter? I see an iPhone sitting on the ‘slightly’ modified vehicle but no proof that it is, in any way, controlling or passing info to the vehicle. thanks for picking up our story! There’s only one request, our site is actually located at http://www.iphoneworld.ca , not http://www.iphoneworld.com, which has no affiliation with us whatsoever….